Shreveport Farmers’ Market will open on Saturday, May 31 and the Benton Farmers’ Market will kick off its inaugural season Sunday, June 1. The Shreveport Market will feature over 150 booths of locally-grown produce, meat, honey, plants, delicious artisan food products, arts and crafts, a Market Café, and music by The Blanchard Jammers. On Saturdays, the farmers’ market takes place in Festival Plaza in downtown Shreveport at 101 Crockett Street from Market Street to Commerce Street. This year, the Market Café, located in the West Pavilion, will feature weekly live entertainment alongside ready-to-eat cuisine covering regional and international specialties. The East Pavilion will house 86 vendors, old and new, with a new section for big farms. Under the Spring Street Bridge is Artists Alley, which features an expanded “bath and body” section this year. A newly-opened area, Bridge Row, will expand the space available for gourmet and specialty items like wine, cheese, and sausage. Saturday markets take place, 7 a.m.-12 p.m., May 31-August 30, with the exception of June 21; Tuesday markets will be held at the east end of Festival Plaza, 3-6 p.m., featuring mostly home-grown fruits, vegetables, and meats. Tuesday markets will be held, June 3-July 15. Shreveport Farmers’ Market accepts SNAP (Supplemental Nutrition Assistance Program) Benefits. Shoppers wishing to use SNAP must present their card at the information booth, located at the tower on the west side of the market, where benefits will be converted to tokens that can be used at participating vendors. Some vendors also accept WIC and Senior Nutrition Food Program vouchers. There is also an ATM on site, and some vendors accept credit cards. Free street parking is available throughout the downtown area, and Festival Plaza is only two blocks east of the Sportran Bus Terminal. A parking lot for drivers with disability tags is located on Crockett Street, just past its intersection with Commerce. There are bathrooms on site, and most of the booths are in pavilions with fans. For more information, visit www.shreveportfarmersmarket.com, or “like” Shreveport Farmers’ Market on Facebook for updates. Those with questions may also call 318-455-5788, or email to farmersmarket@redriverrevel.com. A juicy tomato, yellow squash, peas, corn and more will be available at the first-of-its-kind Benton Farmers’ Market, June 1. Located at the Benton Town Park at 495 Simpson Street behind the Bossier Parish School Board office, vendors throughout Louisiana, Southwest Arkansas and Northeast Texas will offer their locally grown produce as well as baked goods, honey, dairy and meat items, stone ground corn meal, jams and jellies, arts and crafts and much more. Plan to have lunch after church, too. Country cooking will be on the menu, as well as other popular fare, from chicken and dumplings and tamales to homemade ice cream and Italian ices. 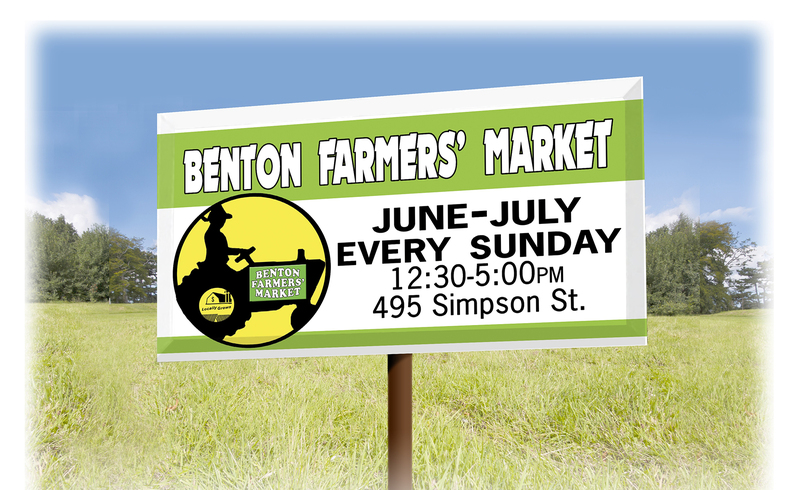 The Benton Farmers’ Market will open at 12:30 p.m. June 1 and run until 5 p.m. There will be live music on opening day as well as children’s activities and games. Throughout the season, June 1 to July 27, there will be various programs and activities scheduled, giving each Sunday market a unique flavor of its own. For a list of vendors, registration information, directions and more, visit our website www.bentonlafarmersmarket.com.